I love listening to podcasts. I've consumed so many shows over the past 5 years that the buttons on my iPod have been worn down to almost nothing. 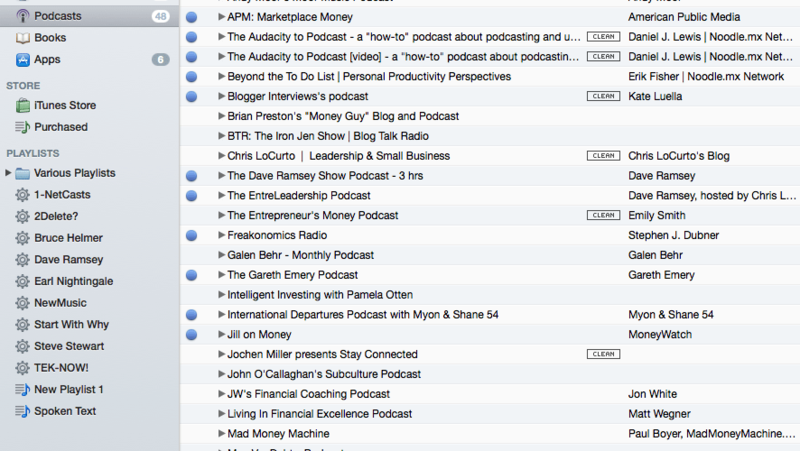 There are more than 30 financial and lifestyle shows that I listen to religiously. However, I am WAY behind and have at least 28 hours of various episodes that are sitting on my computer waiting for their turn to be heard. I'm torn: I want to continue listening to them all but realize there isn't enough time in the day. It is time to Unsubscribe. No more updates, no more downloads, just cutting it off completely and being unsubscribed forever. Below is a link to a survey that will help me decide which financial and lifestyle podcast I will quit. It is up to you now. Go vote for the shows you know I should continue listening to and then vote for the one that I should drop like a hot potato! Click here to take survey, and thank you for your help! Can Google AdSense hurt your brand? I listen to almost all of my podcasts at double speed (unless the speaker is too fast for me to be able to understand). Really helps me get the content I want in less time. I’ve tried that on certain shows (the talk-radio type) but not so much for The Audacity To Podcast and Your Website Engineer, which you really need to concentrate on or with Smart Girls Guide to Life and Money because Jenny Kerr talks so fast.